These comments provided by Neurotechnology are based on NIST PFT II results published on January 17, 2017. In 2017 Neurotechnology fingerprint algorithm was submitted to NIST Proprietary Fingerprint Template Evaluation II. The algorithm 's template matching accuracy was among the best participants in most of the experiments. 1-9 correspond to plain-to-plain fingerprints matching on AZLA dataset. 10-18 correspond to plain-to-rolled fingerprints matching on AZLA dataset. 19-27 correspond to rolled-to-rolled fingerprints matching on AZLA dataset. 28-30 correspond to plain-to-plain fingerprints matching on DHS2 dataset. 31-33 correspond to plain-to-plain fingerprints matching on POEBVA dataset. 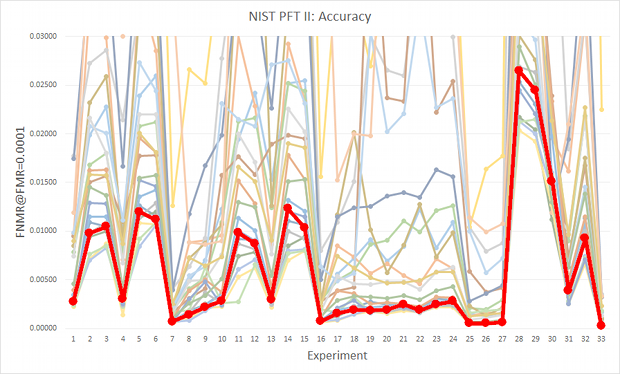 Our latest submission 3Z (in red) is among the most accurate algorithms in all experiments. Our latest submission 3Z (in red) is the fastest during enrollment and second fastest during matching of fingerprint templates. It is also the only one which performs template extraction in under one second in average for any tested dataset – the most common requirement for biometric systems.